“Bad Boy” has finally received some good news. 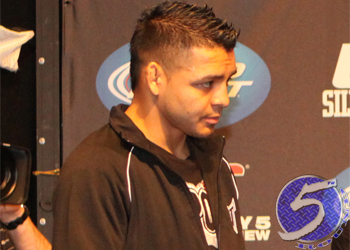 Shortly after being released from the UFC courtesy of a five-fight skid, featherweight Leonard Garcia (pictured) has signed with Legacy Fighting Championship. LFC announced Saturday Garcia will make his promotional debut July 19 against Rey Trujillo at LFC 21. UFC president Dana White more than insinuated Garcia would be cut after dropping his fifth consecutive scrap in a lopsided unanimous decision defeat to Cody McKenzie at UFC 159. Since taking a highly controversial split decision win over Nam Phan in his UFC debut, “Bad Boy” has been downright bad. The UFC typically severs ties with fighters after embarking on three-fight skids, though given Garcia’s gunslinger style, he was granted a reprieve. And then shockingly another one. Garcia owns a 15-11-1 professional record.